Intermountain Search Dogs works directly with our local Spokane County Sheriff’s department to perform search-and-rescue work in the area. They have various units that include air-scenting dogs, ground tracking/trailing and human remains detection dogs. These civilians can be called into action day or night, any time of the year and in any weather to find lost or missing people, victims of drowning or natural disasters such as mudslides, avalanches or floods. They’re used to search for the bodies of homicide victims under the direction of law enforcement and emergency service agencies – at no cost to the agencies. They work hard and under sometimes grueling conditions, and they do so as volunteers – no paychecks, no promotions, no kudos. Just people working dogs and helping their community. HOPE Animal-Assisted Crisis Response is a nationwide program that started here in the Pacific Northwest and provides comfort and encouragement through animal-assisted support to individuals affected by crises and disasters. The dogs and their handlers have been called out to comfort students after school shootings, loved ones and volunteers after natural disasters such as the Oso mudslide in western Washington state and the devastating flooding in Colorado last fall, as well as in the aftermath of the Sept. 11, 2001 terrorist attacks in New York City. Their services bring comfort and connection to many people who don’t respond to traditional counseling and therapy – we all know the power of pets, and dogs in particular, to reach and help someone feel better, and HOPE provides many people that support during their darkest days. 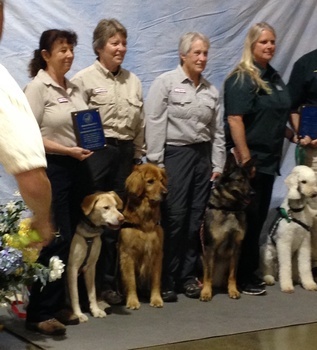 While both groups were on hand to be honored during the holiday weekend, and Paw Print Genetics supports their causes wholeheartedly, we’re also very interested in researching service dogs – those employed by the military, police and civilians for detection, search and rescue, protection and therapy. We’re looking into the genetic mutations that cause inherited diseases in working dogs, breeds such as German shepherds, Belgian malinois and Labrador retrievers, among others, which might impair their ability to perform on the job. The incidence of affected dogs being used as working canines, and perhaps breeding stock, can have a direct impact on the owners, departments and tax-paying citizens who pay for the dogs. These working dogs usually cost a significant amount of money up front due to overseas shipping, specialized training and several years of healthcare. The time spent training one of these dogs further, and creating the working bond between handler and dog, represents another cost in man hours, not to mention the healthcare that they are given – a substantial cost if/when one of these dogs comes down with an inherited disease. By screening working dogs and getting hard data on the rate of incidence in dogs serving as detection, protection and in search and rescue, we can help educate departments, owners/handlers and tax payers on how to select the proper dogs and to protect that investment – while also garnering a greater return by having a healthier veteran dog serving the community longer. The two groups volunteered for genetic screening and allowed us to swab their dogs and to collect and use the data in our study. Just another way they're continuing to serve their community, and another round of thanks and kudos to deservedly bestow upon them.